When Nikhil Samrat took his first mock test on Embibe, we knew he would do really well in the final exam. Extremely calm, measured and balanced in his approach, he seemed rock solid in every way. If JEE was a test match, Nikhil could definitely be compared to Rahul Dravid! Nikhil made 4 mistakes in Physics, something that was simply unacceptable for a student at his level, given that Physics was also his strongest subject. He had a tendency to start every test with Physics as that gave him confidence. However, this test on Embibe actually made him think really hard about his question selection. We drilled this point into his head that even in his favourite subject, there could be questions that he could avoid attempting in the first go and revisit them later and this minor adjustment alone could’ve easily made a difference of atleast 6-10 marks on his final score. This is exactly what happened. 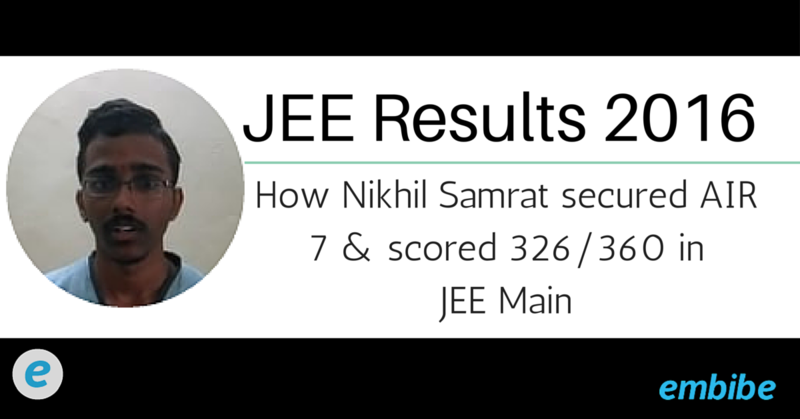 Nikhil ended up scoring 326/360 after scoring 320 in his Embibe test! Nikhil’s approach was very different to Jeevithiesh’s (AIR 4) test taking approach. He would go about attempting the paper in a very systematic, slow and steady way rather than speeding through it. This put him at a slight disadvantage though. 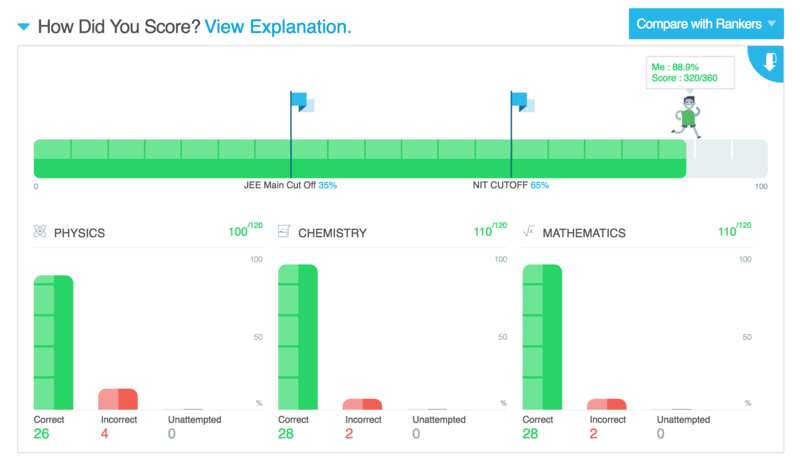 He was only able to go through the entire paper in 140 minutes, while we strongly recommend that the first look through the question paper should be completed in less than 90 minutes (max), as it gives a better sense of overall difficulty level across subjects and helps select questions which can be attempted in the first go thereby increasing overall accuracy. Nikhil’s first look accuracy was only 84% despite spending a lot of time on his first look attempts. Overall, apart from the long time taken to complete going through the entire question paper (first look), Nikhil’s strategy seemed solid. Start with Physics, move on to Math and then Chemistry. He also left time in the end to go through all his attempts just to verify answers and make sure he had not made any careless mistakes. Nikhil’s main issue was question selection in his first look than time management. As is evident in the screen above, his unproductive time (time spent on questions not even attempted) was 0 mins, an amazing achievement! 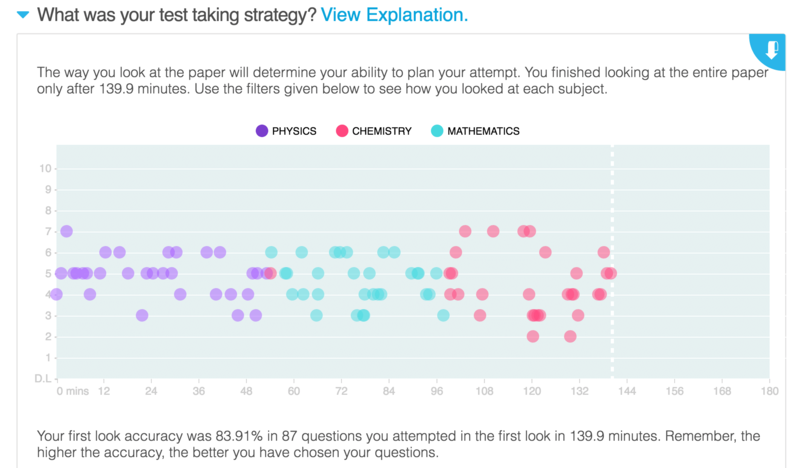 While he took a bit more time in Chemistry (45 mins), where most students only take about 35-40 mins, overall, his time management seemed quite solid. Nikhil rarely made any careless mistakes and that is one of the key takeaways from his test taking strategy. The number of overtime attempts in Physics were quite high in this test but that can be attributed to a tougher Physics section than the other subjects.